Welcome to the underwater BMX bicycle Stunts! Today enjoy abicycleracing game that’s a unique concept for playing bicycleinunderwater. 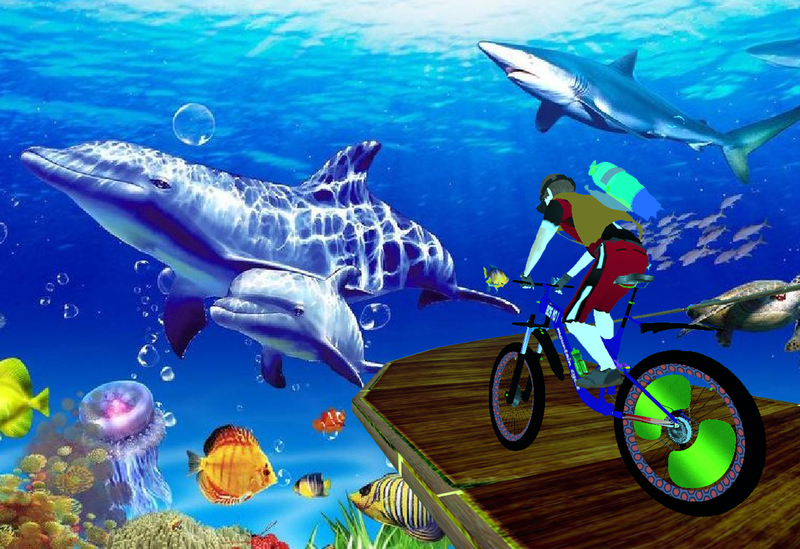 Underwater 3d games give you the desired sensationofriding the amazing and modern BMX underwater bicycle like reallifeexperience. You may have played many bicycle racing games butthisnew underwater BMX bicycle game is completely different allotherracing games. In this game unique racing tracks are placed inthewater these tracks are stunts tracks. Your challenge is toridebicycle on these stunts tracks and complete the challenge. ifyoulike underwater racing games then play this free game.Ridingbicycle on underwater might seems easy task but it’s reallynoteasy. The challenging path of this game is that you ridebicycleunderwater on stunts track. You are in this amazing areawhereeverything is underwater. During playing this game enjoy anaqualife without any stress and worry that anyone is watching you.Yourprimary goal in this racing simulation game is to drive andridebicycle on underwater challenging track. In limited time toclearthe underwater driving mission so ride your bicycle speedyaspossible to reach the destination point within the specifiedtimelimit. There are two limitations one you complete the challengeinlimited time and second you have limited oxygen for survival sogetthe oxygen for long survival. Underwater crazy bicycleracingoffers you multiple challenging and interesting levels.Bycompleting these missions carefully and successfully to becomeaexpert cycle driver on the ocean underwater tracks. Be themasterbicycle rider by playing this underwater cycling racingsimulator3d games.Stunning 3D Graphics, realistic environment ofthe oceanand challenging tracks will force you to play this freegame againand again. The mind blowing and nice sound effects andmusic ofthis game are as much real you will feel that you areactuallydriving bicycle on ocean race tracks. Install this superbgame onyour Android device to enjoy this brand new underwatersimulationgame.Cool and Amazing Features of Underwater BMX Stunts:-Easyresponsive and easy control.- Rapidly pick oxygen forlongsurvival.-Many Challenging and tricky missions.- Differenthighspeed bicycles available free just get the point aftercompletingthe missions.- choose character male or female for ridingthat youlike.- A realistic underwater environment of the ocean.-Amazingsound effects and music.If you really like Underwater BMXbicyclestunts racing games please try other extreme best drivinggames byclicking “More from Developer” button on main menu. Anddon’tforget to rate and review. 3D Hill Climb Racing Car3D Hill Climb Racing Car is a realistic simulation and racinggamethat you need to climb hills by overcoming the obstacles byanoff-road vehicle. You should reach the hill and complete thestagesuccessfully. You have to do your best to avoid falling fromacliff and facing an obstacle, while trying to reach the hill.Youwill be addicted to this game with its stages havingdifficultiesand features different from each other, which receivecontinualupdates.Game Features :- An environment where the physics laws completely prevail! Youhaveto avoid car falling from the cliff using controls.- 4 different models of cars which have technical andhardwarespecifications different from each other (new cars will beadded onnext stages)- High-quality and ever-changing environment models just likerealmountains.- Each stage is different from other that are not boringatall- Different actions that come with new episodes-Best Sound system to be used for entertainment. Animal Hunting 3D : Safari Jeep 2018 is an challenge forplayer where you have skill to drive on offroad on safarijeep and find the African animals and hunt them down on specifictime.Grab the real fun of playing offorad vehicles and shootinggames in this fantastic animals hunting games. Play this animalhunting 3D game with thrilling experience of driving jeep onoffroad jungle find realistic animated animals to hunt inthis mission. The game has Beautiful graphics and realisticscenery.and other excited animations and realistic soundseffects to give you a real feeling hunting animals.If you area good hunter – offroad 4X4 jeep is ready for driving. Grab yoursniper Gun and get on your way to hunt various animals:likeElephant , Camel , Cheeta , rhinoceroses, lions, buffalos, Deer ,geriffa , gorilla and many other African animals.Your goal isto find the animal on safari jeep and kill all animals thenyou successfully clear the level. Get out from jeep and use sniperfor kill the animals and use sniper camera zoom view for betterprecision.In this game your challenge is to drive jeep on offroad way and find the animals on limited time you find and kill theanimals then you successfully complete the missionYour missionsucceed on these conditions1: kill all animals on specific timeOnsome mission give you a bonus time if you kill the animalslike if you kill one enemy then you awarded some amount of timethis is helpful for completing the mission.Your mission failed dueto two reasons1:Time Over2:Player DeadWhen you get out from yourjeep animal attack on you and at the end player dead missionfailed.HOW TO PLAY AND HUNTING:Select level from the gameWhen youplay the game by default you are in jeep just use break and padelto move the jeep forward and backward to find the animals. on leftside “EXIT” button use to get out from jeep If you get out fromjeep and if you want to get again in jeep then move yourself onleft door of jeep or move around the jeep then a “ENTER” button isappear click on it then you again get in the jeep.Drive safari jeepon off road way in jungle and use indicator to indicate the nearestanimal to help the player on finding the animals.Find the wildjungle animals and press the “Exit” button that are on leftside.Then kill the animals use sniper camera zooms for betterprecision.Kill all animals on specific time.Complete first levelthen unlock and play the other levels.If Animal attack on you thentime down stop and if you again get in the jeep then time downstart.Use radar to view and find the animals.Press brake for stopsafari jeep and handbrake to move back the jeepPress padel for racethe jeepDrive jeep on the mountain off-road and jungleGameFeatures: -14+ real African animals and multiple missions.-Realistic natural environment with High quality graphics-Off-roadsimulator 4x4. - Realistic animated African animals tohunt.-Good sound effects.Animal Hunting 3D : Safari jeep 2018 -your best choice!Have a good drive 4x4 jeep on off road wayand hunt Animals! Welcome to the downhill bicycle off-road racing 3D game on thePlaystore. Downhill bicycle off-road race on mountains, bridgesandrivers is filled with challenges and lots of fun. Bicycle racingonhill, which will testing your cycling abilities on hill .Eachlevelis full of challenges Win all the challenges as a good racerinthis bicycle race and show the world you are professional infastbicycle racing. Bicycle racing on hill, is full of adventure.Youcomplete the mission in specific time on each levels. Indownhillbicycle off-road race ride the bicycle on mountain withfullconfidence. Get control on your bicycle and steer with yourpedalsto get real life sensational feelings of heavy bicycleriding.Downhill bicycle off-road race is the one of the bestbicyclegames. Game Features: -10+ real Scene has a lot ofadventures. -Realistic natural Mountain environment with goodquality graphics-Good sound effects. -Complete mission in specifictime -More than10 maps -5 Different weather, -Bicycle race on thehill withrealistic bicycle physics -Optimized high-resolutiongraphics -Freeto Play. Downhill bicycle off-road race - your bestchoice! Welcome to the kids playland simulator most favorite kids gameonthe play store. Kids playland simulator has a lot of fun forkids.Kids playland simulator is an ultimate entertaining game tobeplayed if you are looking for fun for the whole family. Everyoneiswelcomed to play, make fun on different levels. kidsplaylandsimulator levels has -Airplane -Bumper Cars -Enterprise-RollerCoaster -Teacup -The Claw -Troika -Wheel -Wind Seeker-Wipeout Inevery level has a lot of fun and kids enjoying like inreal. HOW TOPLAY: Select level from the game Use camera button tosee player ondifferent views. Use pause button to pause the game orselect nextlevel. Game Features: -10+ real Scene has a lot of funfor kids. -Realistic natural environment with High quality graphics-Goodsound effects. Kids Playland Simulator - your best choice! Welcome to the highway racing cars stunts game on the PlaystoreAreyou bold enough for taking the Highway Racing Car Stuntschallengeand do you have a expertise to master it?Do you like todriveracing car on dangerous areas? If yes then there are two typesofchallenges in this game one survival and other is stuntschallengeselect any challenge and enjoy.On survival challengeperform longjumps on stupendous ramps by pressing boosts buttonknock down andcross all kinds of hurdles.This game is choked withthrill thatcomes with playacting serious stunts. during this gameyou basictask is to cross the hurdles rigorously on stunt mode andsurvivalmode.To complete the levels you would like to avoid hurdleandknowledgeable for the stuntsAccept the challenge on highwayracingcar stunts game Drive at your full speed and you may completethemissions rigorously by avoiding issue. If you have got a skillsofprofessional stunt driver! Not press the brake button as aresultof traffic or other vehicles, therefore you'll run full speedtoperform bootleg stunt actions.You play this game once more andoncemore thanks to the realistic atmosphere of the Iceland andtoughtracks. And wonderful sound effects and music of this gamefeelthat you simply are literally driving automobile on Icelandandmountains race tracks.Install this excellent game on yourAndroiddevice to fancy this spanking new difficultgame.GAMEOptions-------------------------------------------Multiplecompletelydifferent cars to unlock -NEW: Drive with traffic!!!! !-Ramp buttonsgenerate the ramp once crossing theproblem.-Several completelydifferent cameras.-Amazing soundeffects and music.-Free &endless modes for endless fun.-Automobile Boost button for crossingthe hurdles-Many difficultLevels.- Completely different high speedcars obtainable onmoney.Highway Racing Cars Stunts - your bestchoice! We bring a new idea to bicycle racing games which are always funfor BMX riders giving electric vibe to adventure seeker kids. Rideyour kids bicycle on impossible tracks and become an extreme stuntrider of BMX bicycle. Kids bike racing simulation and kids bikeracing has become an old mode. Let’s ride bicycle on sky highimpossible tracks in kids bicycle games. You are playing as kidsbicycle rider and chase your ultimate goal. Let’s start a thrilljourney in bicycle rider race games on impossible bicycle stunttracks that gives you the enjoyment of riding a real bicycle racingand cycle drag simulator. Impossible bicycle tracks games werenever been so thrilling and adventurous. BMX stunt riders of 2017will surely like this adventure cycle riding on difficult ways. Inbicycle rider game perform killer stunts with MTB bicycle by doingrisky jump over the ramps that are sky high. Falling down from highimpossible tracks will make this simulator game level failed. Ridebike almost impossible as the hurdles and obstacles are very hardto complete, so to make it possible you need extreme bicycle racingskills for this zig zag MTB cycle race on impossible bmx bicycletracks with kids bicycle rider addition. You can drive with slow orfast speed and avoid obstacles that come in between your racing andbicycle rider 2017 missions. Features of Impossible Bicycle StuntRider Tracks: ✓ Thrill and challenging levels and real feel ofmidair ramp riding. ✓ The best free mountain bicycle experienceever. ✓ Realistic bicycle race on high offroads. ✓ Race on thechosen MTB or BMX with realistic bike physics. ✓ High resolution 3Dgraphics for realistic feel of cycle racing 2017. Ride like aflying bicycle on high paths and chase down extreme kids ridermissions with Impossible Tracks: Kid Bicycle. Ultimate experienceof cycle riding and MTB offroad race. Impossible BMX brings to you the best of bikes racing and stuntsimulation on challenging and risky tracks. This sky high gameoffers freestyle stunts that include ramp jumps, air stunt, skaterstunts and spectacular biker tricks on challenging paths. Enjoythis mid air madness on your bike! Control your speed and manoeuvrecarefully or you may crash and lose the level.To master bicycleriding tricks on the zigzag roads you need to ride slow withaccuracy. The jaw dropping massive height of these race courseswill make your heart pump fast. Become an ultimate bikes rider heroof tracks and show epic stunt skills dodging extreme obstacles onnarrow tracks and maintaining perfect balance. Flip your bicycle tochange direction, maintain perfect balance over narrow trails, makesuper high jumps on ramps and reach end point while completingthrilling biker riding missions. Impossible BMX Game Features:Rewards after completing each riding obstacle course. Unique Cameraangles for better biking simulation. Eye catching realistic 3Denvironment. Easy & addictive gameplay.